The World Health Organization called on the international community to ramp up contributions to the US$ 148 million in funding required for the next six months’ Ebola outbreak response in the Democratic Republic of Congo – after infection rates saw a worrisome increase in recent weeks. The WHO call came in the wake of recent attacks on treatment centres that set back progress and saw the rate of infections rising again after many weeks of decline. 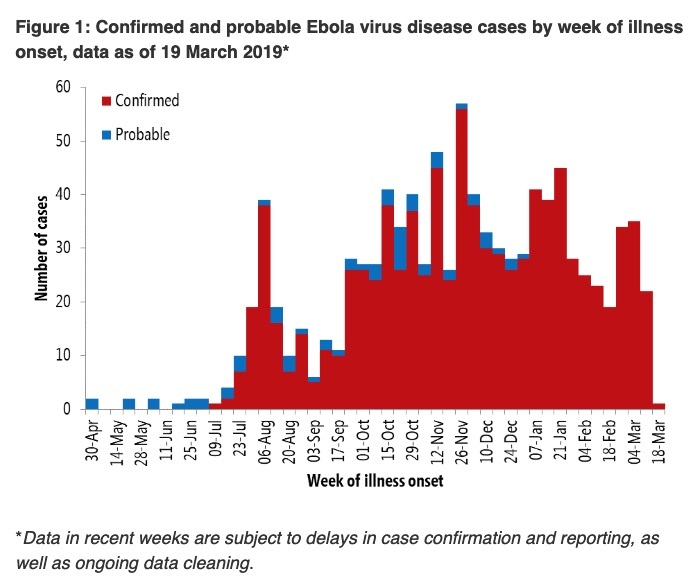 The current outbreak has led to 1000 Ebola cases and claimed over 600 lives since August 2018. Community representatives come to visit a family in the outskirts of Beni to raise awareness about Ebola. “We need redoubled support from the international community, and a commitment to push together to bring this outbreak to an end,” Dr Tedros Adhanom Ghebreyesus, director-general of the WHO, was quoted as saying in a press release, which noted that only half of the required funds had so far been committed. For the next six months, the release explained that “the combined financial need for all response partners is at least US$ 148 million,” but that as of 19 March, “US$ 74 million had been received,” leaving a US$ 74 million gap. The recent attacks on Ebola treatment centres in Katwa and Butembo, the hotspots of the outbreak, “represented the first large-scale and organized attacks targeted directly at the Ebola response,” according to WHO’s latest update on the outbreak. 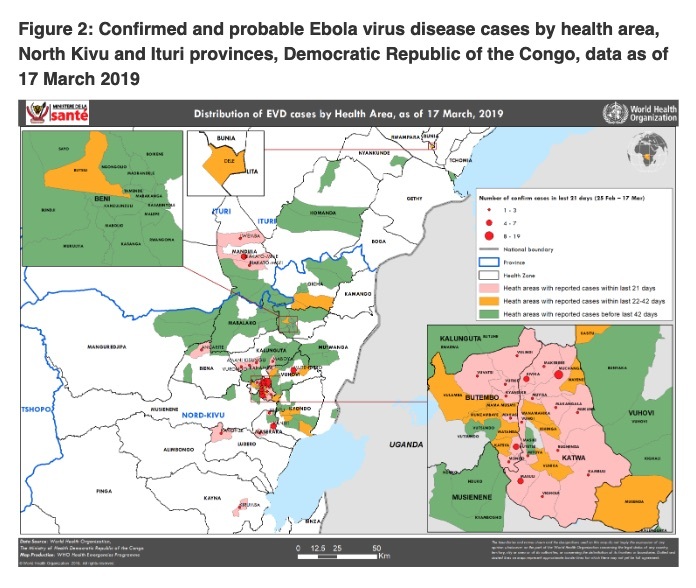 Katwa, Butembo and Masereka in North Kivu Province, and Mandima in Ituri Province, account for over 80 percent of the increasing cases in the last 21 days, and response teams are “fully operational in all outbreak affected areas,” according to the update. Community resistance and mistrust of the Ebola treatment efforts has also limited progress, in part fuelled by coercive treatment measures (HPW, Emergency Response, 14 March 2019). “[T]he persistence of pockets of community resistance and mistrust, exacerbated by political tensions and insecurity, have resulted in recurrent temporary suspension and delays of case investigation and response activities in affected areas; reducing the overall effectiveness of interventions,” the update explains. “As we mourn the lives lost, we must also recognize that thousands of people have been protected from this terrifying disease,” Dr Matshidiso Moeti, regional director for the WHO in Africa, said in the release. 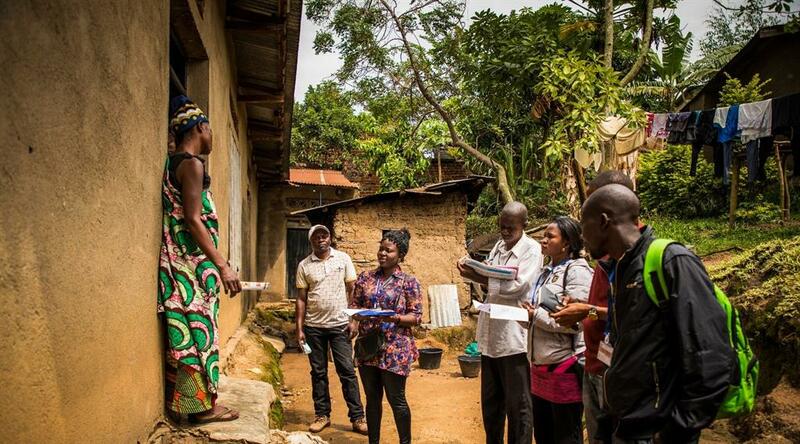 Beyond ending the Ebola outbreak, the WHO has also committed to work with the government and the community to build more resilient health systems. “We will still be in DRC long after this outbreak has finished, working with the government and communities on the road to universal health coverage. We are committed to improving the health of the people of DRC now and in years to come,” Dr Tedros said in the release. Click here to view an enlarged map. Image Credits: World Bank Group/ V.Tremeau, WHO.